Alice Horton used to make some yummy doughnuts on “Days of Our Lives,” and now you can too! She was a “Days of Our Lives” classic, and she served a homemade treat that became a classic too. Now you can make your own doughnuts a la Alice Horton. Elka Ostrovsky on “Hot in Cleveland” once said she never met a doughnut she didn’t like. We at Soap Cities agree. So we were tickled pink–pink frosting, that is–when we saw this excerpt from a cookbook we wrote about recently containing recipes by soap by stars. This is one inspired by a soap character and a dish often mentioned on the soap she was on. Eat Out Loud posted this recipe for Alice’s doughnuts. 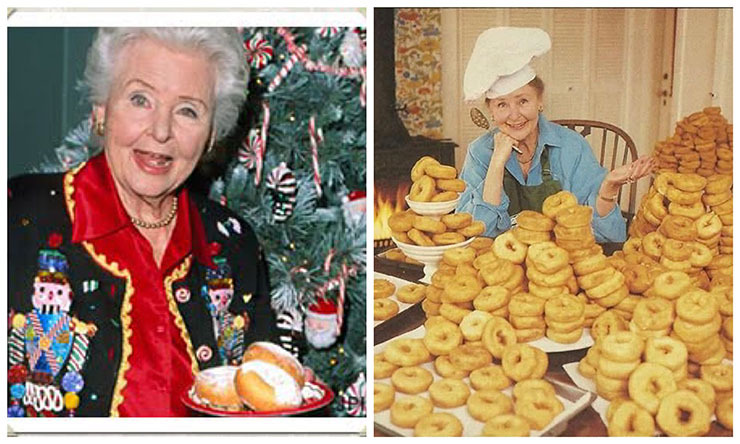 Perhaps one way “Days of Our Lives” (Days) icon and soap legend Frances Reid, who portrayed Alice, maintained her lovely figure and cooked up these circular confections was by baking and not frying them. That’s how you’ll make them if you follow this recipe. Make sure there’s one ingredient you DON’T add. JJ once caused some doughnut delirium when he baked some, shall we say, special, doughnuts of his own. Back then they would have been illegal nationwide, if you know what we mean, and only legal today in some states! Adrienne (Judi Evans) and some other Salem leading ladies got a little loopy when they accidentally ate JJ’s special batch instead of Alice’s more traditional ones. Sadly, Reid passed away in 2007. She had portrayed Alice Horton since since Days debut in 1965. So when you bake up a batch of her doughnuts, remember her fondly in honor of her contributions to daytime.